I wrote about celebrated 20th Century British Oxford philosopher/historian Isaiah Berlin and an old friend in my prior post, An Elegy for Lifelong Friendship. Another noteworthy event in Berlin’s life with an old friend occurred in 1996, a year before Berlin’s death. The British National Portrait Gallery offered artist Lucian Freud, Sigmund Freud’s grandson, a commission to paint a portrait of his choice. 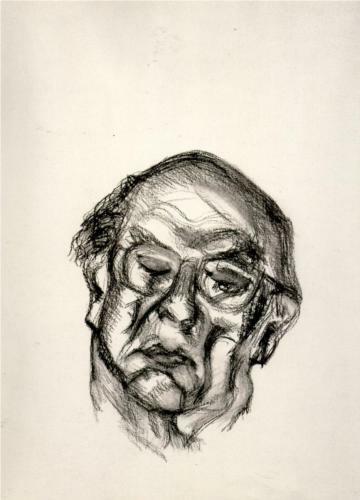 From a universe of choice, he chose to paint his old friend Isaiah Berlin. Lucian Freud first met Isaiah Berlin in 1938 at tea with Sigmund Freud at the Freud quarters in London at Maresfield Gardens, now the Freud Museum. Isaiah sat in an old battered armchair while Freud sketched him first in pencil and then began to paint him in oils. The time passed in gossip and then in silence, broken by the sound of charcoal on paper and paint on canvas. As Freud worked, Isaiah passed in and out of sleep. In the charcoal drawing, roughly eight by ten inches, Isaiah’s eyes are closed, his head back against the back of the armchair, his mouth shut, the curvature of his upper lip is perfectly caught, as is the shape of his bare forehead and his cheeks sunken and hollowed with age. In the oil painting, not much larger than a regular sheet of paper, Isaiah is shown leaning back with his head resting on the back of the battered armchair. Unlike the pencil sketch, his eyes are open. He is looking away to the left, full of melancholy, at something we cannot see.